We’d love your help. Let us know what’s wrong with this preview of The Whole Clove Diet by Mary W. Walters. To ask other readers questions about The Whole Clove Diet, please sign up. [2012-07-24] Woohoo! My book arrived today and it's a biggie :-) I had a quick flick through and it looks good. Disclaimer #1: My observations cannot be deemed wholly objective. I am easily impacted by external influence, the last movie I saw, the last book I read, the last comment I heard from Dr. Phil or my own editor. Like Scrooge, I am uncertain my observations aren’t persuaded by a fragment of underdone potato. Disclaimer #2: I received a copy of this book from the author herself, a disclosure the importance of which is known only to those who may deem it significant. (I'm a first born. I'm just follo Disclaimer #1: My observations cannot be deemed wholly objective. I am easily impacted by external influence, the last movie I saw, the last book I read, the last comment I heard from Dr. Phil or my own editor. Like Scrooge, I am uncertain my observations aren’t persuaded by a fragment of underdone potato. Mention has been made by others of the complex plot and solid characterization of THE WHOLE CLOVE DIET. Most excellent. And scene description was nothing less than a masterful slight of hand with an economy of words, igniting this reader’s neural receptors to engage all my senses (and while I’m not much fond of the odor of wet wool, especially while I’m reading, it was exact, exquisite, and thankfully brief). I love this author, the way she thinks, the way she writes, her humor and her perception. Insight into the human soul is her miraculous gift, bordering on B&E of the psyche, and with it she created a protagonist I was most willing with whom to invest my time, sympathy and encouragement. Her issue isn’t really about the unwanted pounds she’s gained; it is about shedding the weight of emotional fat she’s accumulated since her childhood. And she knows it, deep inside – evidenced by her obsession with hair-cuts, as though trimming the outside of her head might help fix the inside – but her focus on finding the abracadabra fix-all delays her from reaching any real Ah-Ha moment. With writing so delightful, I nonetheless persisted, and I’m glad I did. Rita gloriously, if not glamorously, rediscovers her backbone, both physically and psychically, and the ending after the ending is that she succeeds, thrives, and dances to her own rhythm. I know she does. Miraculously too, when she tunes into and turns down her own level of crazy, so do the other characters. They don’t change, but the contrast changes, and their own brand of once glaring psychosis diffuses into something easily understandable, even justifiable. When she no longer sees herself as a victim, the others don’t seem so much like bullies. Another deft piece of the now-you-see-it-now-you-don’t magic of Ms. Walters. This is a book I would read again. In fact, I may do so now. And BTW, for those readers who do not live near to or over the border of Canada, or were not blessed with a French-Canadian mom … a ‘serviette’ is what we here in the States call a napkin. Just FYI. If your shoulders are not always wider than your hips and you can't quite give up cigarettes, you have something in common with Rita, the beleaguered and overburdened heroine of THE WHOLE CLOVE DIET. If that's not altogether the case, chances are you'll still find her an engrossing subject and her story a worthwhile read. Rita is first encountered in her doctor's office, where she learns another physician will be covering for him that day. Unlike her regular doctor, the substitute has no toleranc If your shoulders are not always wider than your hips and you can't quite give up cigarettes, you have something in common with Rita, the beleaguered and overburdened heroine of THE WHOLE CLOVE DIET. If that's not altogether the case, chances are you'll still find her an engrossing subject and her story a worthwhile read. Rita is first encountered in her doctor's office, where she learns another physician will be covering for him that day. Unlike her regular doctor, the substitute has no tolerance for Rita's addictions to food and nicotine that have her well down the road to morbid obesity and lung disease. Rita's reaction to his scorn is the first indication she is weighted down by a lot more than excess poundage and impaired respiratory function. A clueless, self-serving husband, his silently disapproving parents, the long-suffering parents of his deceased first wife, and the hateful children he brings to his marriage to Rita, are enough to send anyone on a doughnut binge. But Rita must also contend with her own parent, a stifling, belittling mother who never misses a chance to flaunt her perceived superiority over her misbegotten offspring. The overall situation has Rita's weight spiraling into the red zone and her self esteem sinking to all time lows. A paid relationship with her hairdresser, a thin, attractive woman with outsize ambitions, is constant reminder of Rita's gross unattractiveness and lack of ambition. An ongoing deception is about to end when her regular doctor refuses to renew a prescription for the birth control pills Rita has long hidden from her gullible husband. The stage is set for massive change, but not before Rita is repeatedly exposed to her lack of willpower through a series of social and family events--the worst of which casts her as the obvious glutton when, unbeknownst to the accusing hostess, a tray of special treats is in fact gobbled by one of the slimmer guests. For a while, Rita's increasing desperation is defined by reliance on so-called miracle diets. In a great ironic touch, author Mary W. Walters includes samplings of several such diets as chapter beginnings. All the diets are doomed to fail, of course, and with each failure, Rita's despair is further underscored. The story is told in present tense, which enables a subtle sense of urgency even when the action necessarily flags to reflect Rita's weak and wussy ways. Walters' deft hand with injections of seriocomic relief and bittersweet revelation serve to lighten the load when the going is sometimes reduced to sheer trudgery. As Rita finally begins to assert herself, a death in the family becomes catalyst--albeit a slow one, more like a time-release capsule than a fast-acting pain reliever--to her escape from repression. She receives sanctuary, support, and the secret of the whole clove diet from an unexpected source and eventually embarks on a journey of self-realization destined to save her from herself. THE WHOLE CLOVE DIET is an unsparing examination of the brand of self-denial that leads to self-loathing rather than self-improvement. Although Rita starts out as a difficult character to embrace, she becomes one to cheer for and believe in when honesty points the way to freedom. The Whole Clove Diet follows a woman as she struggles with some really big issues. Every single day is a challenge. The bluntness of Doctor Graves (Rita can't get over the irony of his name) forces Rita to face the reality of her weight and the threat it poses for her future health. Being forced to face the reality of her weight, causes Rita to start looking at other aspects of her life that she's previously ignored. The book is well written, the characters are multi--dimensional and very relatab The Whole Clove Diet follows a woman as she struggles with some really big issues. Every single day is a challenge. The bluntness of Doctor Graves (Rita can't get over the irony of his name) forces Rita to face the reality of her weight and the threat it poses for her future health. Being forced to face the reality of her weight, causes Rita to start looking at other aspects of her life that she's previously ignored. The book is well written, the characters are multi--dimensional and very relatable. Walters did a very nice job of using her words to paint a picture of her main and secondary characters. I was very impressed with Walter's ability to make sure every single character has a place in the story. The relevance of each character makes it easy to keep track of them, as well as making them relatable. On the other hand, just because you can relate to the characters, it doesn't mean you have to like them. Walters does a great job of filling her story with some characters you want to hug, some you want to hand out with, and some that you want to smack upside the head. I read this book twice. During the first read-through, about in the middle, I became annoyed with Rita, the book's main character. I wanted her to grow a backbone! But, I found myself thinking about Rita as if she was a real person instead of someone Mary Walters created. I think Rita got to me so much because I am an adult child of a parent with extreme addiction issues -- my mother was addicted to alcohol and prescription medications. Some of the discomfort I felt was because Rita was so reali I read this book twice. During the first read-through, about in the middle, I became annoyed with Rita, the book's main character. I wanted her to grow a backbone! But, I found myself thinking about Rita as if she was a real person instead of someone Mary Walters created. I think Rita got to me so much because I am an adult child of a parent with extreme addiction issues -- my mother was addicted to alcohol and prescription medications. Some of the discomfort I felt was because Rita was so realistic. This, of course, speaks to the brilliance of Walters' characterization. She nailed addiction. It was uncomfortable for me. It made me think of my childhood. Coupled with Rita's addictions was the presence of a mother who was unfeeling and selfish. The parallels to my own life story were difficult and uncomfortable. 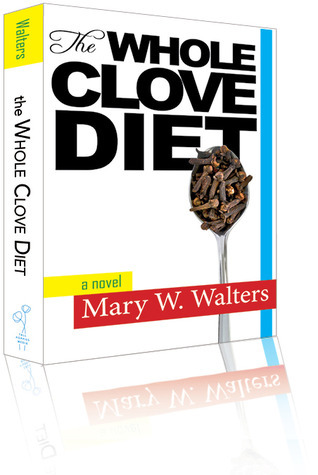 Mary Walters' The Whole Clove Diet is more than a good read. It is the deepest insight into women and what they think and how they talk to themselves. Rita, the protagonist, is not only over weight, she is depressed about it, and it consumes her whole waking life--even some of her sleeping life. I can't remember a time when I have laughed so hard or felt so sad, and even so angry at a character in a book. This isn't just about losing weight and the perpetual yo-yo stuff, This is about looking in Mary Walters' The Whole Clove Diet is more than a good read. It is the deepest insight into women and what they think and how they talk to themselves. Rita, the protagonist, is not only over weight, she is depressed about it, and it consumes her whole waking life--even some of her sleeping life. I can't remember a time when I have laughed so hard or felt so sad, and even so angry at a character in a book. This isn't just about losing weight and the perpetual yo-yo stuff, This is about looking into our souls and finding out who we are as women. The character of Rita was wonderfully well drawn. At war with herself and caught in a spiral of self disgust at her addictions to food and tobacco Rita seems bent on self destruction. She slingshots between fad diets, makes feeble excuses for herself, becomes increasingly isolated and feels increasingly helpless. Mary Walters takes us on a journey that will be familiar to many of us. However for Rita there is a turning point. A visit to an unsympathetic doctor gives her the jol An engrossing read. However for Rita there is a turning point. A visit to an unsympathetic doctor gives her the jolt she needs and gradually she finds a way to escape. A great read. Sometimes beauty is in simplicity; this book doesn't try to be anything it's not. It's not trying to be literature, it's trying to tell the story of one woman's struggle with her demons. Well written, great characters, and believable. I thoroughly enjoyed it. Very interesting and different. Even though I wanted to shake the characters at times, the main character evolved slowly into the person you hoped for but I still don't know about that husband, LOL. Good read. this is a terrific read that has just been honored with a B.R.A.G.Medallion! Mary W. Walters is the award-winning author of 4.5 novels, a collection of short stories, a non-fiction book about grant-writing for academics, and hundreds of essays, articles and blog posts on a host of subjects. She has been executive director of a writers’ organization, awards facilitator at at university, a writing teacher, a freelance writer, editor and grants consultant – and, throughout it Mary W. Walters is the award-winning author of 4.5 novels, a collection of short stories, a non-fiction book about grant-writing for academics, and hundreds of essays, articles and blog posts on a host of subjects. She has been executive director of a writers’ organization, awards facilitator at at university, a writing teacher, a freelance writer, editor and grants consultant – and, throughout it all, she has been a fiction writer. Mary has won a Writers Guild of Alberta award for excellence in writing and been shortlisted for several other writing awards. She has won an Achievement Award from the Province of Alberta, and is listed in Who’s Who in Canada. She lives in Toronto and on the Internet.